In the 1830’s abolitionists discovered the rhetorical potential of re-conceptualizing southern newspaper advertisements as data. They “took an undifferentiated pile of ads for runaway slaves, wherein dates and places were of primary importance … and transformed them into data about the routine and accepted torture of enslaved people,” writes Ellen Gruber Garvey in the book Raw Data is an Oxymoron. By creating topical dossiers of ads, the horrors of slavery were catalogued and made accessible for writing abolitionist speeches and novels. The South’s own media had been re-contextualized into a persuasive weapon against itself, a rhetorical tool to bolster the abolitionists’ arguments. The Latin etymology of “data” means “something given,” and though we’ve largely forgotten that original definition, it’s helpful to think about data not as facts per se, but as “givens” that can be used to construct a variety of different arguments and conclusions; they act as a rhetorical basis, a premise. Data does not intrinsically imply truth. Yes we can find truth in data, through a process of honest inference. But we can also find and argue multiple truths or even outright falsehoods from data. Take for instance the New York Times interactive, “One Report, Diverging Perspectives,” which wittingly highlights this issue. Shown below, the piece visualizes jobs and unemployment data from two perspectives, emphasizing the differences in how a democrat or a republican might see and interpret the statistics. A rising tide of “data PR” often manifesting as slick and pointed infographics won’t be so upfront about the perspectives being argued though. Advocacy organizations can now collect their own data, or just develop their own arguments from existing data for supporting their cause. What should you be looking out for as a journalist when assessing a piece of data PR? And how can you improve your own data journalism by ensuring the argument you develop is a sound one? Contextual journalism—adding interpretation or explanation to a story—can and should be applied to data as much as to other forms of reporting. It’s important because the audience may need to know the context of a dataset in order to fully understand and evaluate the larger story in perspective. For instance, context might include explaining how the data was collected, defined, and aggregated, and what human decision processes contributed to its creation. Increasingly news outlets are providing sidebars or blog posts that fully describe the methodology and context of the data they use in a data-driven story. That way the context doesn’t get in the way of the main narrative but can still be accessed by the inquisitive reader. In your process it can be useful to ask a series of contextualizing questions about a dataset, whether just critiquing the data, or producing your own story. Who produced the data and what was their intent? Did it come from a reputable source, like a government or inter-governmental agency such as the UN, or was it produced by a third party corporation with an uncertain source of funding? Consider the possible political or advocacy motives of a data provider as you make inferences from that data, and do some reporting if those motives are unclear. When was the data collected? Sometimes there can be temporal drift in what data means, how it’s measured, or how it should be interpreted. Is the age of your data relevant to your interpretation? For example, in 2010 the Bureau of Labor Statistics changed the definition of long-term unemployment, which can make it important to recognize that shift when comparing data from before and after the change. Most importantly it’s necessary to ask what is measured in the data, how was it sampled, and what is ultimately depicted? Are data measurements defined accurately and in a way that they can be consistently measured? How was the data sampled from the world? 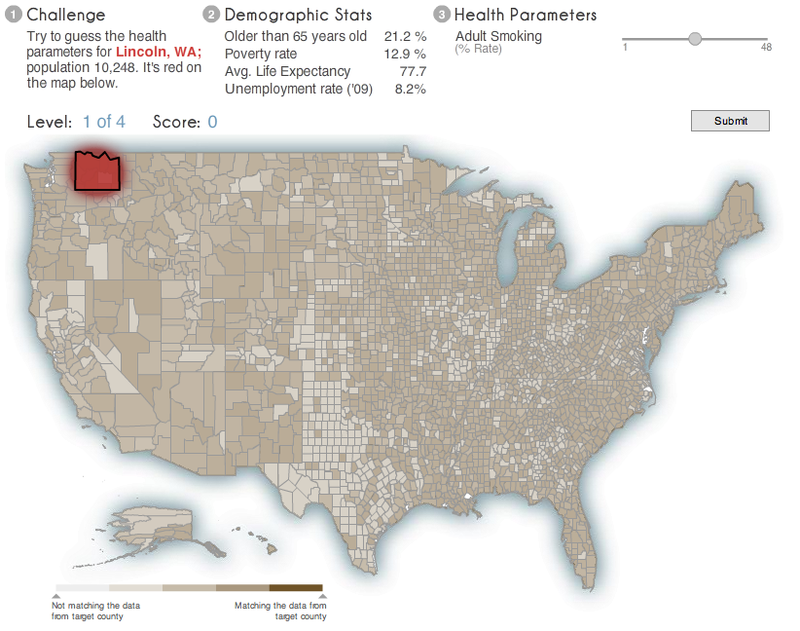 Is the dataset comprehensive or is it missing pieces? If the data wasn’t randomly sampled how might that reflect a bias in your interpretation? Or have other errors been introduced into the data, for instance through typos or mistaken OCR technology? Is there uncertainty in the data that should be communicated to the reader? Has the data been cropped or filtered in a way that you have lost a potentially important piece of context that would change its interpretation? And what about aggregation or transformation? If a dataset is offered to you with only averages or medians (i.e. aggregations) you’re necessarily missing information about how the data might be distributed, or about outliers that might make interesting stories. For data that’s been transformed through some algorithmic process, such as classification, it can be helpful to know the error rates of that transformation as this can lead to additional uncertainty in the data. Let’s consider an example that illustrates the importance of measurement definition and aggregation. 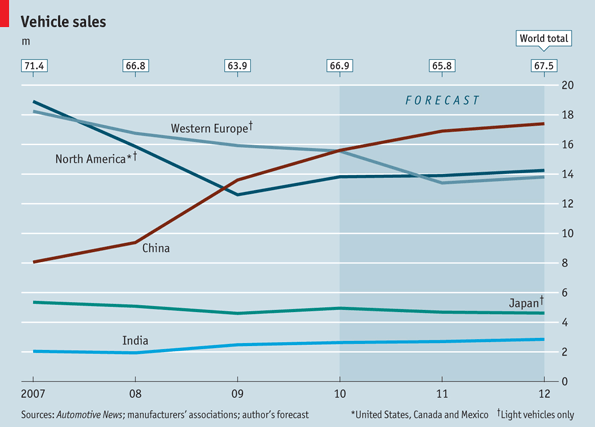 The Economist graphic below shows the historic and forecast vehicle sales for different geographies. The story the graph tells is pretty clear: Sales in China are rocketing up while they’re declining or stagnant in North America and Europe. But look more closely. The data for Western Europe and North America is defined as an aggregation of light vehicle sales, according to the note in the lower-right corner. How would the story change if the North American data included truck, SUV, and minivan sales? The story you get from these kinds of data graphics can depend entirely on what’s aggregated (or not aggregated) together in the measure. Aggregations can serve as a tool of obfuscation, whether intentional or not. It’s important to recognize and remember that data does not equal truth. It’s rhetorical by definition and can be used for truth finding or truth hiding. Being vigilant in how you develop arguments from data and showing the context that leads to the interpretation you make can only help raise the credibility of your data-driven story. Note: this is cross-posted on the CUNY Tow-Knight Center for Entrepreneurial Journalism site. Recently there’s been a surge of interest in automatically generating news stories. The poster child is a start-up called Narrative Science which has earned coverage by the likes of the New York Times, Wired, and numerous blogs for its ability to automatically produce actual, readable stories of things like sports games or companies’ financial reports based on nothing more than numeric data. It’s impressive stuff, but it doesn’t stop me from thinking: What’s next? In the rest of this post I’ll talk about some challenges, such as story schema and modality, data context, and text transparency, that could improve future story generation engines. Without inside information we can’t say for sure exactly how Narrative Science (NS) works, though there are some academic systems out there that provide a suitable analogue for description. There are two main phases that have to be automated in order to produce a story this way: the analysis phase and the generative phase. In the analysis phase, numeric data is statistically analyzed for things like trends, clusters, patterns, and outliers or exceptions. The analysis phase also includes the challenging aspect of condensing or selecting the most interesting things to include in the story (see Ramesh Jain’s “Extreme Stories” for more on this). Followed by analysis and selection comes the task of figuring out an interesting structure to order the information in the story, a schema. Narrative Science differentiates itself primarily, I think, by paying close attention to the structure of the stories it generates. Many of the precursors to NS were stuck in the mode of presenting generated text in a chronological schema, which, as we know is quite boring for most stories. Storytelling is really all about structure: providing the connections between aspects of the story, its actors and setting, using some rhetorical ordering that makes sense for and engages the reader. There are whole books written on how to effectively structure stories to explore different dramatic arcs or genres. Many of these different story structures have yet to be encoded in algorithms that generate text from data, so there’s lots of room for future story generation engines to explore diverse text styles, genres, and dramatic arcs. It’s also important to remember that text has limitations on the structures and the schema it supports well. A textual narrative schema might draw readers in, but, depending on the data, a network schema or a temporal schema might expose different aspects of a story that aren’t apparent, easy, or engaging to represent in text. This leads us to another opportunity for advancement in media synthesis: better integration of textual schema with visualization schemas (e.g. temporal, hierarchical, network). For instance, there may be complementary stories (e.g. change over time, comparison of entities) that are more effectively conveyed through dynamic visualizations than through text. Combining these two modalities has been explored in some research but there is much work to do in thinking about how best to combine textual schema with different visual schema to effectively convey a story. There has also been recent work looking into how data can be used to generate stories in the medium of video. This brings with it a whole slew of challenges different than text generation, such as the role of audio, and how to crop and edit existing video into a coherent presentation. So, in addition to better incorporating visualization into data-driven stories I think there are opportunities to think about automatically composing stories from such varied modalities as video, photos, 3D, games, or even data-based simulations. If you have the necessary data for it, why not include an automatically produced simulation to help communicate the story? It may be surprising to know that text generation from data has actually been around for some time now. The earliest reference that I found goes back 26 years to a paper that describes how to automatically create written weather reports based on data. And then ten years ago, in 2002, we saw the launch of Newsblaster, a complex news summarization engine developed at Columbia University that took articles as a data source and produced new text-based summaries using articles clustered around news events. It worked all right, though starting from text as the data has its own challenges (e.g. text understanding) that you don’t run into if you’re just using numeric data. The downside of using just numeric data is that it is largely bereft of context. One way to enhance future story generation engines could be to better integrate text generated by numeric data together with text (collected from clusters of human-written articles) that provides additional context. The last opportunity I’d like to touch on here relates to the journalistic ideal of transparency. I think we have a chance to embed this ideal into algorithms that produce news stories, which often articulate a communicative intent combined with rules or templates that help achieve that intent. It is largely feasible to link any bit of generated text back to the data that gave rise to that statement – in fact it’s already done by Narrative Science in order to debug their algorithms. But this linking of data to statement should be exposed publicly. In much the same way that journalists often label their graphics and visualizations with the source of their data, text generated from data should source each statement. Another dimension of transparency practiced by journalists is to be up-front about the journalist’s relationship to the story (e.g. if they’re reporting on a company that they’re involved with). This raises an interesting and challenging question of self-awareness for algorithms that produce stories. Take for instance this Forbes article produced by Narrative Science about New York Times Co. earnings. The article contains a section on “competitors”, but the NS algorithm isn’t smart enough or self-aware enough to know that it itself is an obvious competitor. How can algorithms be taught to be transparent about their own relationships to stories? There are tons of exciting opportunities in the space of media synthesis. Challenges like exploring different story structures and schemas, providing and integrating context, and embedding journalistic ideals such as transparency will keep us more than busy in the years and, likely, decades to come. Inspired by the recent Design for America contest, I’ve been advancing the notion of Game-y Information Graphics with Rutgers Ph.D. student Funda Kivran-Swaine.¬† Using data published by the HHS Community Health Data Initiative we designed a game-y info graphic called Salubrious Nation. The idea is pretty simple really: we’re exploring the application of aspects of game design such as goals, scores, and advancement to news and information graphics. How do users understand an info graphic differently when it’s presented as a game? Do they have different insights? Do they explore more of the underlying data which drives the graphic? “Salubrious” as we call it asks users to guess the community health of counties across the nation by using hints such as demographic data and map-based visual feedback to inform their guesses. Heavily data-driven. The closer the player’s guess to the actual data, the more points they get. The fun of it is in trying to use the statistics that are revealed (things like poverty rate, life expectancy, and unemployment rate) to guess the hidden data (such as obesity, smoking, air pollution etc.) At the end of a series of increasingly difficult “levels” the player can see how they stack up against other people who have completed the game. Try it out here. One nice aspect of this approach is that as we develop more game mechanics that fit well in the genre, different data sources can be plugged in very easily. Another hope is such game-y presentations of data will encourage users to engage more deeply with the content. We’ll be assessing these properties of the medium more formally this summer and hope to report the results soon!